Time. It's your most precious resource, and something you can never get back. As a believer in business, I know you want to make the most of your time to make the biggest impact. Typically, I love helping entrepreneurs pinpoint their priorities, streamline their processes, and create work/life balance to optimize productivity. But today's post is a little bit different. I want to talk about how to actually enjoy your time -- in the present moment. Depression is thinking about the past. Anxiety is thinking about the future. Peace is thinking about the present. This quote helped to articulate a mindset pattern that I've noticed in myself and in the women that I work with when it comes to how they perceive time. How many times have you thought something like this? Making friends was so much easier when I was in college. When I first started my business, there was much less competition. I had so much more time to work before I had my daughter. When we get stuck in the past and how things were, we hold on to things that no longer serves us and that can make us sad. In these cases, I like to celebrate those memories and acknowledge the seasons of my life that meant to me. I also recognize the need to honor, grieve, and let go the past so I can make room for the new. On the opposite side, sometimes we worry about our future and obsessed over things we don't really have control over. What if that client says no to my proposal? How am I going to manage all of my competing priorities? What am I going to do if XYZ doesn't work out? I'm an advocate for dreaming big, planning for the future, and counting the cost, but when we hold on too tightly to the HOWs, and WHATs, it can be nerve-racking. Whenever I start to feel anxious about something, it typically means that I've misplaced my trust in God to provide, or misplace trust in myself to take the intentional actions. For me, it helps to talk out what I'm feeling with my husband and trusted friends and pray for the peace that surpasses all understanding. This leads me to my last point: peace is thinking about the present. Time is the MOST precious when we enjoy the present moment. All of the productivity hacks in the world don't mean much if you're still stressed out and not loving life. Your return on effort will increase when you focus on doing one thing at a time (and doing ONLY the things that matter). Your clients and relationships will flourish when you get rid of distractions and really listen and contribute to the conversations. Your fulfillment will skyrocket when you take the time to enjoy each moment, instead of rushing from one thing to the next. So, how can you start enjoying the present to maximize your time? 1. Develop a mindset practice. Your mindset is your thoughts and beliefs that affect your actions, and can either be limiting or empowering. Once you create awareness around your thoughts, you can begin to reprogram them. My favorite mindset practices are prayer and journaling where I have the space to write out thoughts, process emotions, record gratitude, and prayers. This can be a safe place for you to recognize if you're feeling depressed, anxious, or joyfully present. Our brains aren't wired to do lots of things at one time, so try to focus on doing one thing at a time. For work, I like to do "time-blocking" where I'll have a chunk of time devoted to content creation, and another devoted to client calls. Another principle I use is thinking of time not as tasks on a to-do list, but rather, the role I'm playing during that time. For example, early morning I wear my "mom" hat as I feed, change, and play with my baby. I can focus on being a mama and enjoy those moments. Then, when I move into my office I put on my "CEO" hat to take care of my business, or my "coach" hat to help my clients. 3. Know that a "YES" to one thing is a "NO" to another. You get to choose how you spend you time by saying "YES" to the things that matter, and "NO" to the things that don't quite serve you. As you get clear on your vision, goals, and boundaries, I encourage you to regularly reflect on if the things you're doing align with your bigger purpose. Let your "YES" be a "HECK, YES!" so you can set yourself up to commit to be fully present instead of wishing you were somewhere else. I hope that this post helped shift a perspective on how you invest in your most precious resource. I'm here to help you steward the resources you've been given so you can build an intentional life and successful business. 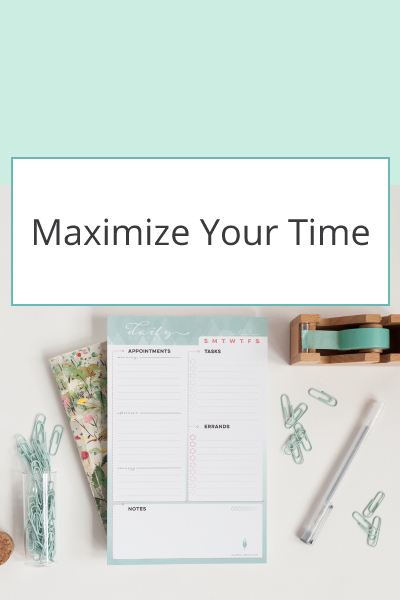 If you want more, you can download a free copy of the e-book, "Maximize Your Time, Talent, and Resources." I collaborated with my friend, Jenna Shriver, to identify common beliefs that hold you back, and help you move forward to truly stewarding your God-given gifts well.